Search and seizure warrants for former and incumbent judges suspected of involvement in the top court’s power abuse scandal, in which the former Supreme Court chief justice is alleged to have used trials as bargaining chips to curry favor with then-President Park Geun-hye, have been denied, leaving the prosecution little evidence to work with. Meanwhile, prosecutors have seized computer hard disks and other materials from the home and office of a former judge surnamed Moon and of a businessman surnamed Jeong. A special investigative unit is looking into a bribery case involving Jeong, who is suspected of having treated Moon, then a judge based in Busan, to expensive golf outings and trips to high-end bars that offered illicit sexual services, in 2016. Moon is suspected of being involved in a separate bribery trial in which Jeong was a suspect, interfering in the judicial process. The prosecution believes the National Court Administration, which was under the leadership of former Chief Justice Yang Sung-tae, did not take any disciplinary actions against Moon, although it was aware of his illicit acts, as Moon had close ties with Hyun Ki-hwan, the former senior presidential secretary to the now-ousted President Park. 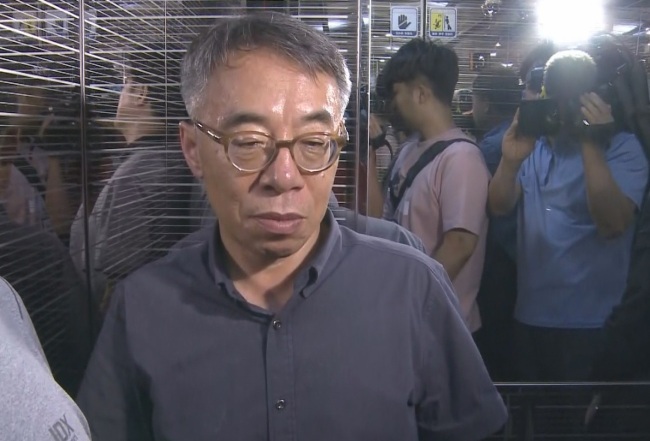 The prosecution believes the NCA wanted to use Moon’s connection with Hyun to establish an appellate court in the country’s judiciary. While in office, former Chief Justice Yang actively lobbied -- allegedly abusing his judicial power -- the presidential office to establish the appellate court. Under his leadership, the Office of Court Administration spent some 320 million won ($285,000) of taxpayers’ money to create online cartoons, YouTube videos and even subway ads on Seoul Metro promoting the need for an appellate court, from 2014-2015. Among the "politically sensitive" trials Yang used as bargaining chips to gain political favor from the ex-President Park was the one involving eldery Koreans who were forced into labor during Japan's colonial occupation. The prosecution believes that Yang deliberately tried to defer a ruling on the specific trial as the ex-President's administration sought to improve relations with Tokyo. Some experts say Yang wanted to establish the particular court to dominate what would have been the second most powerful court in the country by seizing the authority to select and appoint judges for the institution. According to the prosecution, businessman Jeong was charged in 2016 for bribing Cho Hyun-oh, the former commissioner of the National Police Agency, with some 50 million won ($44,194). Moon, who was a judge at the time, allegedly stole some court documents and secretly handed them over to Jeong, while the bribery trial -- in which Jeong was a suspect -- was going on. The special investigative unit requested seizure and search warrants for all judges involved in the bribery trial of the businessman Jeong and Cho, a former commissioner of the National Police Agency, but they were all denied. Moon, who used to serve as a judge, currently practices as a lawyer. The Seoul Central District Court said it is hard to argue that the documents leaked by Moon interfered with the bribery trial in which Jeong was a suspect, and therefore issuing the seizure and search warrants was unnecessary. The prosecution immediately protested the court’s decision, saying that it is too early to conclude that Moon’s interference did not have any impact on the trial on Jeong, and that there is sufficient evidence that former and incumbent judges have been complicit in the scandal. “It is extremely unfair to deny the warrants for the judges, without any concrete reasons,” the prosecution said in a statement.